Bacon's intrinsic understanding of the human figure provided limitless possibilities in reflecting states of anxiety, morbidity, death and fear. His repetitive depiction of the isolated figure in the seclusion of an interior and a disturbing ambiguity only compound the feeling of innate despair and deny any easy narrative. Coupled with his exacting compositions and application of pigment, which is painted on the reverse of primed canvas, Bacon creates an exhilarating juxtaposition of form and field. In 'Study for self-portrait' Bacon portrays himself, as in many of his portraits, contained within a geometric 'interior' form that evokes the trial of Nazi Adolf Eichmann in his courtroom glass cage.2 Isolated and imprisoned by the 'exterior' expanse of the canvas, Bacon lurches forward in a distorting and twisting spasm which doubles and blurs as if in constant motion, yet remains anchored to the chair. His aim in painting these disturbing and isolated figures was to distort into reality - not away from reality - to reveal the truth and the essence of the person rather than merely paint an illustration. 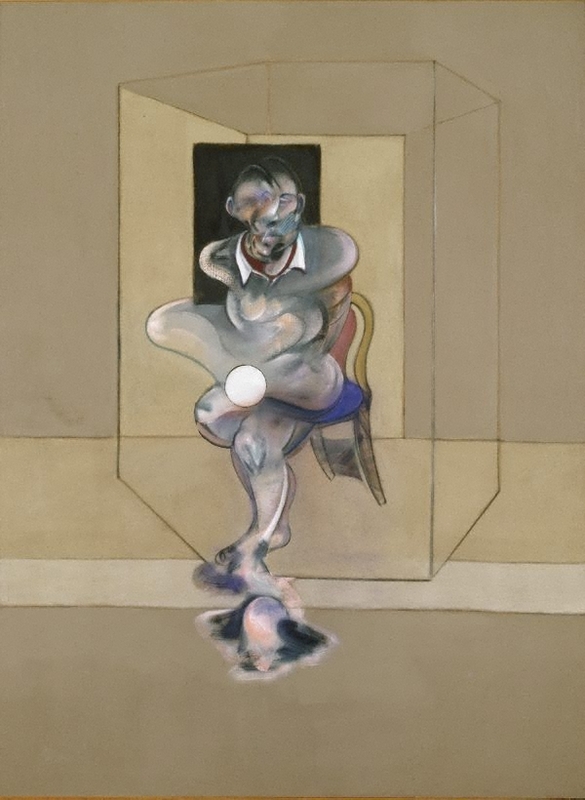 Bacon argued that the only way to convey fact or truth was through a form of distortion, a distortion that reflected life's suffering and despair.3 Within the spasmodic event, the figure oozes and dissolves through the barrier of the containing form and splurges into the foreground. It is as if the body, in reaching the limit of the barrier, removes a part of itself from itself and thrusts it out in a frenzied attempt to escape the containing space. All that remains at the point of disjuncture is a circular void, the detached flesh already decaying in the empty field beyond him. The contrast between the disrupted fleshiness of the body and the clean expanse of the colour field heightens the sense of physical abjection. The brute and raw nature of the figure represents in some ways what Bacon refers to as the dung heap of life. In this self-portrait Bacon looks on the world with a squeamish horror, his face doubled and blurred in his desire to capture the human scream of suffering. Signed and dated u.l. verso, black fibre-tipped pen "Francis Bacon 1976". 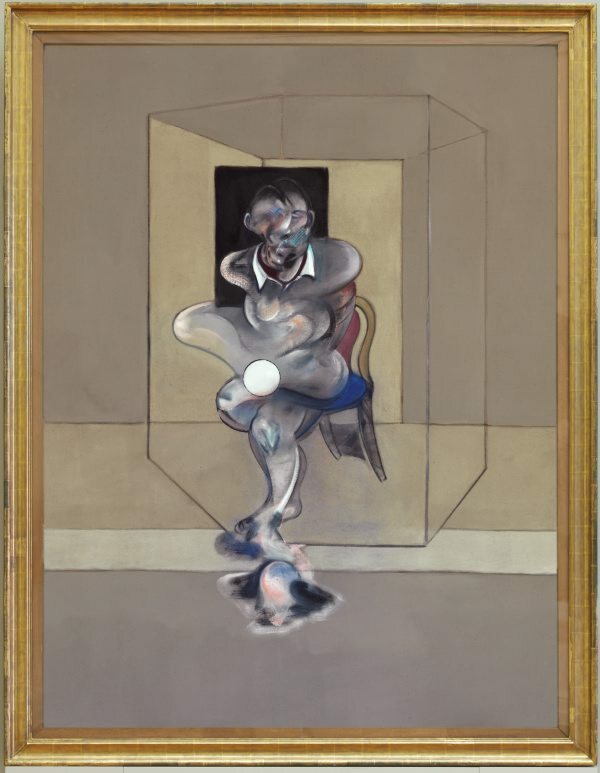 Elvira Adelstein, Look , 'Francis Bacon portraying the human predicament', pg. 20-21, Heidelberg, Jun 1993, 20-21 (colour illus.). Donna Brett, Contemporary: Art Gallery of New South Wales Contemporary Collection , 'Expression and the figure', pg.108-153, Sydney, 2006, 116, 117 (colour illus.). René Free, Art Gallery of New South Wales handbook , 'European', pg. 36-56, Sydney, 1988, 56. Renee Free, Art and Australia , 'European Acquisitions: 1972-83', pg. 63-67, Sydney, Spring 1984, 64 (colour illus. ), 67. Renée Free, AGNSW Collections , 'The western heritage, Renaissance to twentieth century', pg. 108-172, Sydney, 1994, 172 (colour illus.). Bruce James, Art Gallery of New South Wales handbook , 'Western Collection: Paintings and Sculpture', pg. 17-77, Sydney, 1999, 70 (colour illus.). Bernard Rigby, Look , 'Francis Bacon and the law of Entropy', pg. 17, Melbourne, Oct 1999, 17 (colour illus.). Michael Wardell, Look , 'Mervyn Horton's bequest', pg. 11-12, Sydney, Jun 2004, 11. Australia's national collections , Sydney, 1980, 257 (colour illus.). Francis Bacon , Caracas, 1978, (colour illus.). cat.no. 8. Used for poster for exhibition. From caves to canvas: an introduction to western art , 'From the Inside: Abstract Expressionism', pg.249-262, Sydney, 1992, 259 (illus.). Francis Bacon: La France et Monaco , Monaco, 2016, (colour illus.). Francis Bacon: five decades , Sydney, 2012, 194, 195 (colour illus. ), 235 (colour illus.). From caves to canvas: an introduction to western art (Second edition) , 'From the inside: Abstract xxpressionism and new sculpture', pg.295-312, Sydney, 1998, 304, 305 (colour illus.). Art Gallery of New South Wales catalogue of British paintings , Sydney, 1987, 10 (illus. ), 11. Francis Bacon: paintings 1945-1982 , Tokyo, 1983, 109.